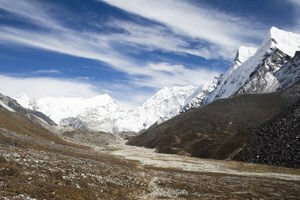 Makalu is a mountain that is challenging for professional mountaineers. This is one of the most difficult objects for conquering because its slopes are extremely steep with ridges. Peak Makalu is the fifth highest peak in the world. Located 22 kilometers east of Everest on the border between Tibet and the Nepalese side of China, in the Himalayan mountains. It rises to 8463 m in altitude and is an isolated peak with a shape resembling a four sided pyramid. Neighboring peak, Chomo Lonzo is linked with Makalu , but is less in altitude at 7818 m.
The area was declared a National Park and Reserve. The nature conservation in this part of the area is a priority project. The goal is to help develop it with minimal human intervention, as tourism is not given priority. Makalu is quite near Everest; its natural pictures there are very different from those around the highest peak on earth. Locals live mainly in the low mountain areas the concentration being mostly in the south. People there are of sherpa and limbu ethnicity. The first attempt to conquer the summit was made in 1954 by an American expedition. They climbed on the South edge, but heavy storms caused them to stop at 7100 m. The first successful expedition was a tribute to the French climbers. Then in 1955 a group of adventurers with Jean Francois climbed from the north face and north-east ridge. The names of climbers who have managed to conquer Makalu are Lionel Terray and Jean Couzy. On May 23, 1970 Japan also recorded their names among the people who had climbed to the top. This time they conquered the mountain from the southeastern edge.